After the first week of June, Traci (my lovely wife) asked me what I wanted to do for Father’s Day weekend. Bike parks in Park City were opening that weekend, but I wanted to go out of town and ride somewhere new. Letting the idea sit for a couple days, I remember seeing a video showing off the Jug Mountain Ranch a couple of years ago. Mountain bikers would get shuttled to what looked like a network of bike park quality trails. 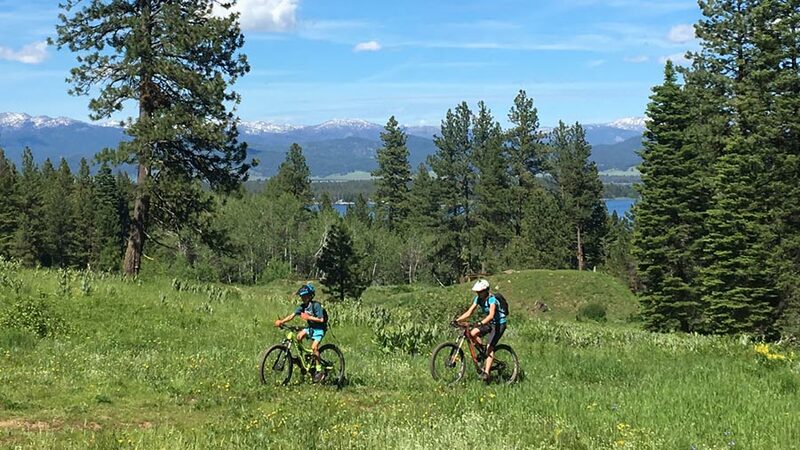 Following some quick research for campgrounds in the area and a few more riding options, I emailed Traci at work with the subject ‘What about McCall, Idaho?’ and included some links. She replied… “Looks pretty good. Let’s do it”. 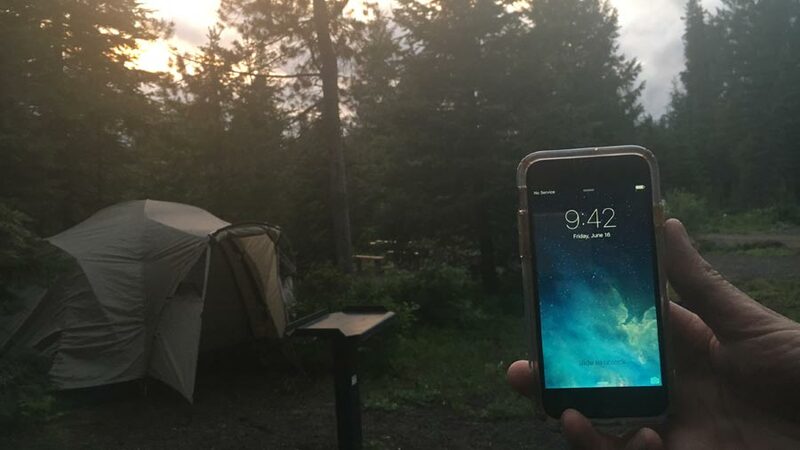 The most desirable campsites were reserved because we never seem to plan more than a few days ahead, so we had to settle for a site in the Cold Springs Campground near the Lost Valley Reservoir. Our next step was getting reservations for the Jug Mountain Ranch (JMR) mountain bike shuttle. JMR’s most popular offering is an award-winning public golf course. 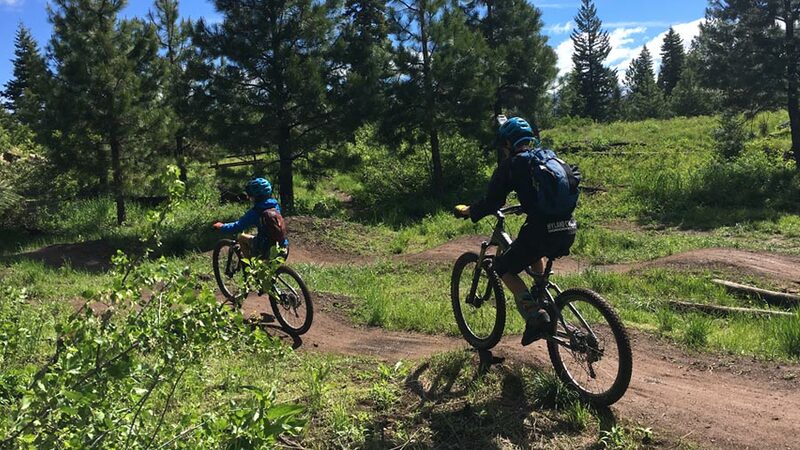 Now, if I was calling for a Father’s Day tee time instead of a mountain bike shuttle reservation 10 days before Father’s Day, I’d be a bit concerned. A quick chat with Matt at the JMR pro shop resulted in a reservation for my family at 9am on Father’s Day, 2017. We were in business. Here’s our youngest taking a lap on a skinny feature at the grown over Tamarack Resort skills park. This was just one of our stops on a quick weekender to McCall, Idaho. McCall Idaho is a small resort town at the southern tip of Payette Lake located a little over a 2 hour drive straight up from Boise via state road 55. We live in Salt Lake City and a quick Google Map search told us the road trip would take us around 8 hours each way. Our family’s last trip to Idaho was a mud season sojourn in the fall to Sun Valley. This was when the kids were too small to get after it on the mountain bikes. 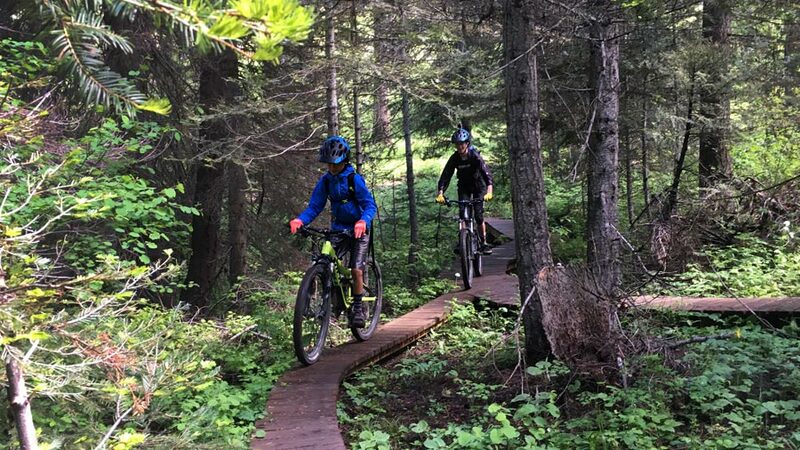 I was very excited to see how our two boys would fare (aged 10 and 13) now that their skills and experience were up-to-speed with riding blue and black trails. Unfortunately, our trip was limited to Friday afternoon through Sunday evening. If you remove the drive time, that’s only about 20 hours of daylight. I did my best to make the most of Saturday by having us start at the Bear Basin trails. We learned that there was a nice looking network of trails between our campground and McCall. After that, we would head over to a nearby trail called Goose Creek. Or, head over to Brundage Resort as it was their opening weekend. The drive up was pleasant and mostly uneventful. We listened to a book on cd called Peter And The Sword Of Mercy by Dave Barry and Ridley Pearson. That’s right – no DVDs for us. To my wife’s credit, our two boys are well-trained travelers. They behave so well in the car that it never ceases to amaze me. They say ‘music soothes the savage beast’. Well, we have learned that stories soothe the savage boys. Traci and I enjoy the books on cd almost as much as the kids. As we were making our way near Delco, Idaho – we noticed a loud intermittent buzzing and humming coming from the storage box on top of our van. 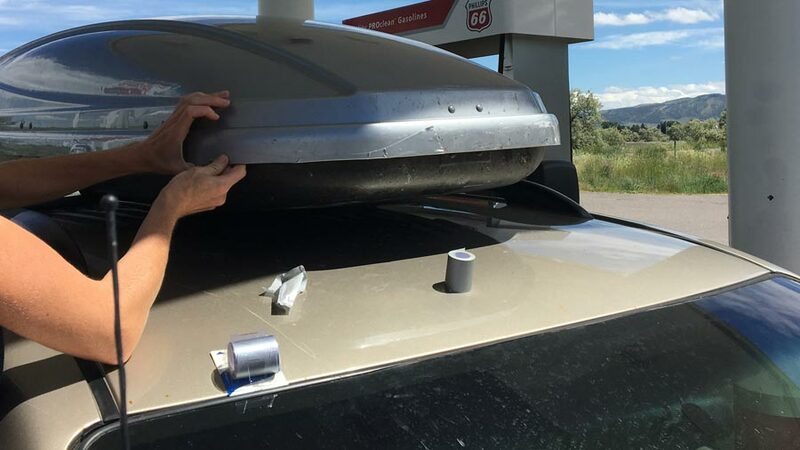 We pulled over on I-84 and saw that the top of the storage box had separated a little from bottom and was probably causing a vibration. We have learned to include duct tape as part of our first aid kit (for bikes and people) due to personal experiences. After a little digging around in the van for a minute, the tape was found, but there was only a little bit left on the roll. Traci climbed on the hood of the van and affixed the last of the tape to keep the storage cage closed until we could get some more in Delco when we fueled up. Getting farther up north and closer to the campground, the landscape changed from farms and open plains to mountains, alpine trees, meadows and water quite suddenly. This transition always sneaks up on me. One minute, we’re cruising through a gazillion acres of potatoes… then, whammo! “Look at that lake!. Look at that reservoir! Looks at those horses running!”. Jim Morrison was right, the west IS the best. It was getting near dinner time on Friday night and we were about an hour from our campground. We agreed to start looking for a place to eat dinner. 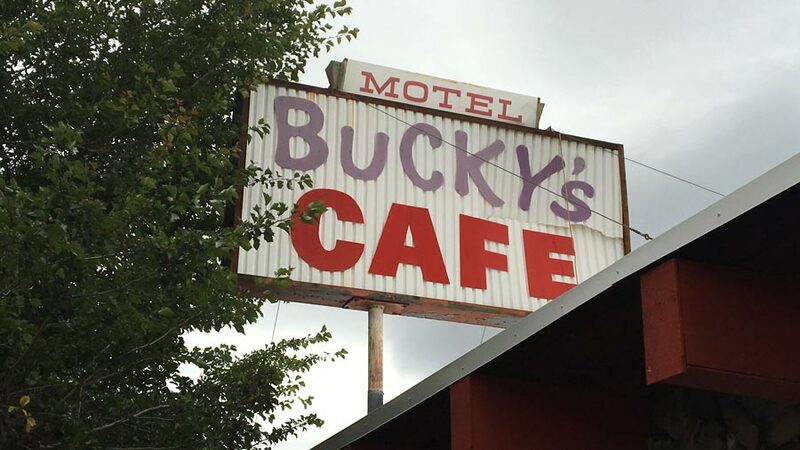 We stopped at Bucky’s Cafe in Cambridge. The kids were hesitant because we normally stop for sandwiches at Subway when we travel. I told them that this would be a great new experience because places like these have corn dogs and chicken fried steak. “Haha. What’s a chicken fried steak?” said my youngest. We entered the restaurant and it was classic. A bar style counter, old milkshake machine, and tables covered with thick plastic tablecloths. Our server took our drink order and dropped off menus. I excitedly ordered chicken fried steak. “We’re out of chicken.” said our server. I replied “But I wanted chicken fried–”. 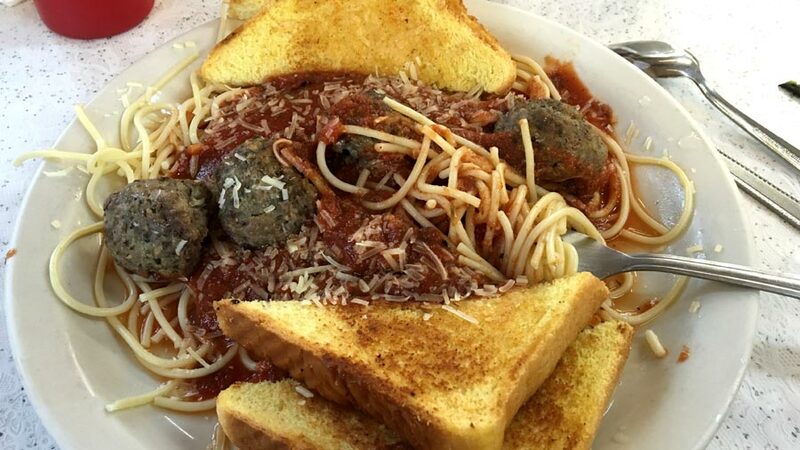 I am not one to argue with restaurant staff as they are the last ones to ensure that the food arrives with only the ingredients listed on the menu- if you get my drift. I was bummed, but certainly not upset. We were just happy to eat along the way and not stop at a chain restaurant. 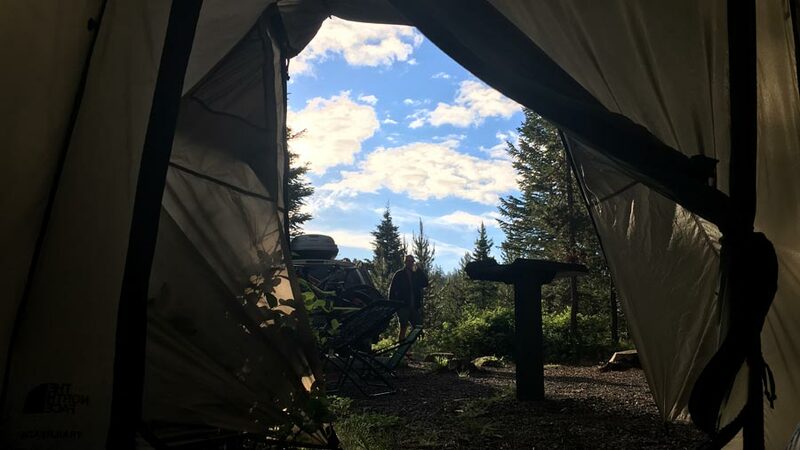 When we arrived at our camp site, we were pleasantly surprised at how high the sun was at 8:30pm. That’s what happens when you travel a few hundred miles north of Salt Lake in the summer. You get bonus time. At 10:00 it was still light enough to set up a tent without a flashlight or headlamp if necessary. We all slept well that night. I always sleep well when camping. Our camp was a ways from the nearest town, so there was no cell phone service and that meant no texts or emails. Technological silence is golden. Following breakfast the next day, it was off to the Bear Basin trails. We drove out to the zone, got on the bikes and made out way up a trail called Baby Bear. It rained the previous day and apart from a few scattered puddles, it was hero dirt. The grade of the trail was not difficult and the switchbacks were wide and compressed. After Baby Bear, we connected with Sleepy Hollow and continued climbing. This part of the ride was only 1.5 miles until we reached the first ridge. Our kids made the ascent with ease. The signage in the area was very good. On top of the ridge, a sign told us a skills park was a short distance away. Why wouldn’t we check that out? The skills park was only a small pump track, but fun nonetheless. We returned to the ridge and rode a short 1.3 mile stretch called Blue Ridge Loop. Again, the kids pedaled this with no complaints. One section of this stretch included a skinny feature that elevated about 4 feet off the ground over a span of 20-something feet and then descended back to the trail over another 20 feet or so. The apex of the feature was anchored to a couple of trees and the kids had to maneuver their bars to make it through. After Blue Ridge Loop, we ended up at a trail called the Drain. The total length of the Drain is only about a mile, but it’s a ton of fun. The most prominent features of the trail are its well-manicured berms. They are built high enough that you can carry ample speed from one to the next. They are wide and packed in very well. The lower part of the trail features a few table jumps and rollers that can be jumped as doubles. If we had more time, we would have done another lap on this great track. My wife remarked that Bear Basin was a great place for young, beginning mountain bikers to get their feet wet. The trails are smooth and not threatening. The grade of the ascents is also comfortable where riders as young as 5 or 6 could give it a go. I originally wanted to move on to Brundage, but their website stated that due to remaining snow, only a beginner trail was open at the resort. Planning our next move was helped by some locals in the parking lot. I asked them about the Goose Creek trail nearby and one of the locals said that the top third of that still had snow. Rats. I asked about Tamarack Resort. One of them told me other than qualifying for a downhill race going on, the trails to the west of the bike park were open and in good shape. Off we went. Tamarack Resort is on the west side of Lake Cascade. It is about 35 miles south of McCall. 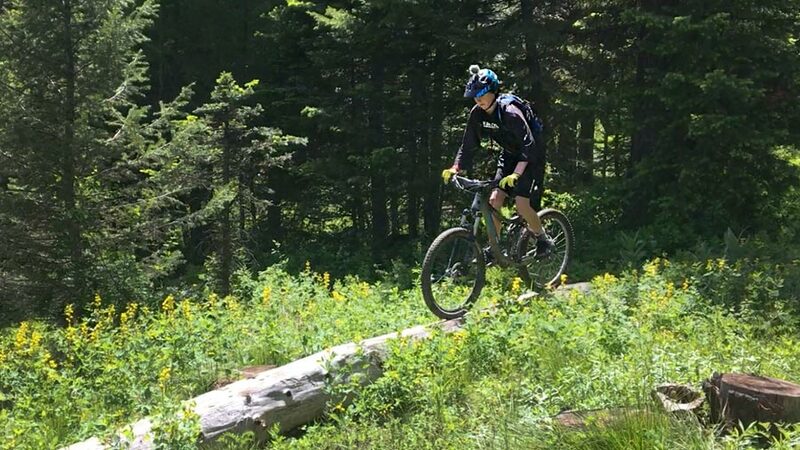 There was a downhill mountain bike event taking place – a stop on the Northwest Cup schedule. We stopped in at an information booth and a resort employee told us to start at the Cottage Trail and start branching out from there. We took a trail map and got our pedalin’ on. The trail map indicated that there was a skills park and a jump park along the Cottage Trail. When we arrived at the skills park, it was mostly grown over but my kids found a great figure-8 skinny that was probably a couple hundred feet long. They took turns trying to complete the whole thing and our 10 year-old did the whole thing first without any crashes or dabs. He was pretty proud of himself. 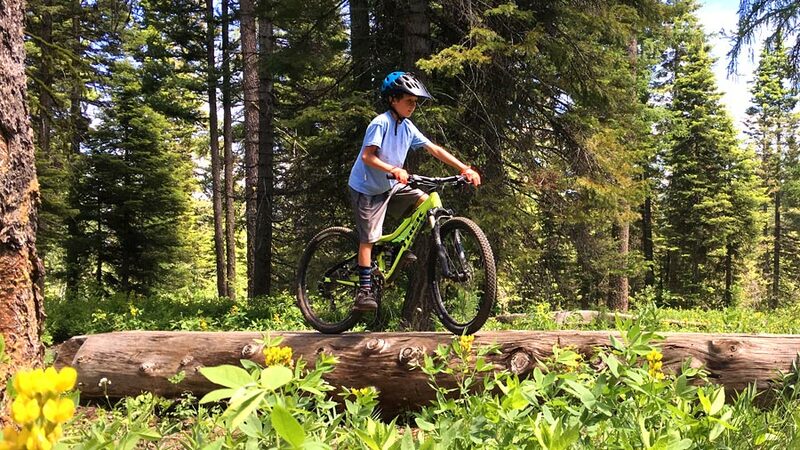 This was the first thing on his mountain biking resume that he was able to do before his thirteen year-old brother. 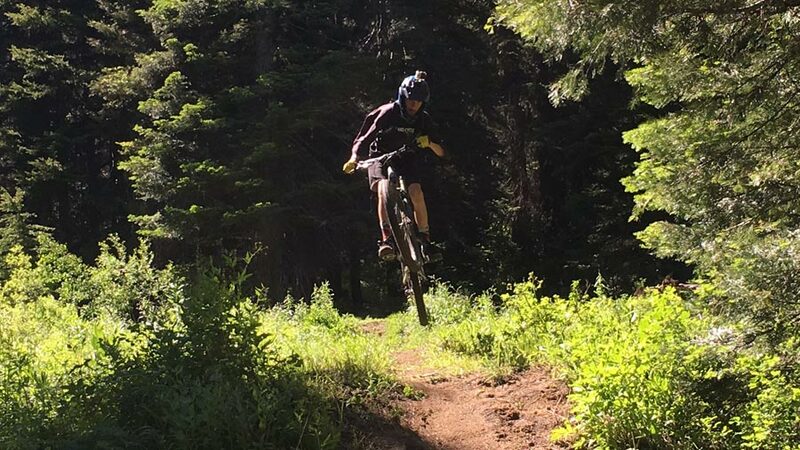 Tamarack Resort’s dirt jump park was overgrown, too. We ran into a local that said after the recession of 2010, people had a hard time spending time and money maintaining and riding the area. Even though the jumps weren’t pristine, the kids still rode them. My 10 year-old took a spill in some stinging nettle and headed back to the resort base with mom to get cleaned up. My 13 year-old and I pedaled up from Cottage Trail to Merlin. That was a good time. Merlin had about a half dozen good sized table jumps, berms and flow. After our first run, we got the entire family up for another lap. On the way back to the village base, the kids screwed around on a tow bar lift. They’re both still light enough that they can sit on a tow bar and make it swing back-and-forth without their feet hitting the ground. Hmmmm. What does one do in the McCall area after riding the trails? You choose one of the several hot springs in the area and chill out, of course. In addition to doing everything else important for the family, my wife is also manages the extracurricular activities. She chose the Gold Folk Hot Springs. This was wonderful. It cost $40 for our family of four and it was not very crowded. The hot springs is developed and there are six pools ranging in temperature from 85º to 110º. One of the pools has a white sand bottom. The dirt road was a little rutted, but nothing to prevent an ambitious group of vacationers looking for a soak. Another good night’s sleep brings us to Sunday. We hurriedly made breakfast, broke camp, and headed off to Jug Mountain Ranch. The Ranch is nestled against McCall’s eastern mountains about 10 miles south of town. We checked in at the clubhouse, signed waivers and hopped on our first shuttle before 9:30. It’s a bumpy ride to the top, but the anticipation of finally getting to ride these trails smoothed the trip up the mountain. Our kids really enjoyed the shuttle, too. Aside from not having to pedal up, they enjoy looking out the sides, speaking with other riders, and just being part of the scene. At the top of the shuttle ride there are three trailheads: Berm and Ernie, DoeJoe, and Double Shot. We started off on Berm and Ernie. Due to rain in the area prior to our arrival, the dirt and trails were nothing short of immaculate. Even the locals said this was the best conditions the trails have been. I asked them if it ever gets dusty and they said yes, absolutely – we were just enjoying the luck and fruits of Mother Nature’s labors. 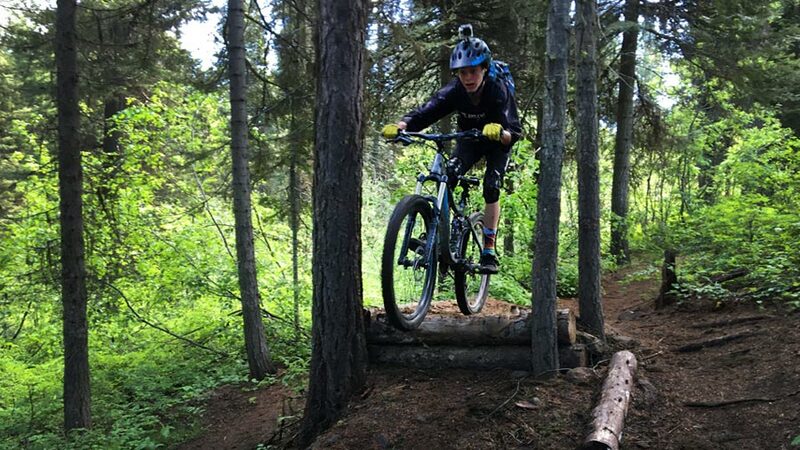 Berm and Ernie is an intermediate rated trail featuring well-sculpted berms, short technical rock features, a wood ramp that could be hopped or rolled, table jumps, and even a small step-up and step-down. Everyone in the family except Wyatt rode this trail several times. DoeJoe is a green flow trail. If you ride this one, be sure to carry speed or the short ascents will slow you down. I only rode this once and had to pedal a couple of times because I wasn’t going fast enough. Our oldest son Wyatt hit it off with a local who was willing to show him around. Wyatt was able to get on Double Shot (black) and Stitches (black). Both of these trails feature bigger jumps and/or gap jumps, technical rock rolls and drops. Wyatt could not wipe the smile off his face after each of his runs. Jug Mountain Ranch was a very good experience and I hope we have the opportunity to ride it again sooner rather than later. The vibe was awesome and the locals were fun to ride with and talk to. We totally lucked out with the trail conditions being so good. Weather and trail conditions can always be a roll of the dice – but when you win, you can win big. Traci also mentioned that a lot of the local rippers could have been competing at Tamarack Resort for the downhill race the day we were at JMR. Often there were empty seats on the shuttle. The long drive home was a pretty good experience, too. I took the time to write about one of our new favorite places to ride mountain bikes and look at all the photos/videos we got along the way.